Jacob Borg engraved his name in the history of Finn Harps as they beat Limerick in the promotion/relegation playoff 3-0 on aggregate to seal promotion to the Irish Premier League last weekend. 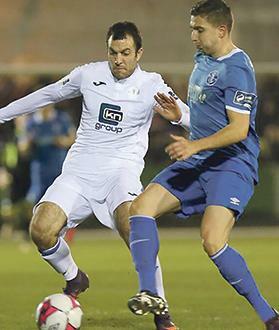 Jacob Borg (left) in action for Finn Harps in the Irish First Division. The Maltese-Australian joined the Harps from Balzan last July, midway through the First Division season, as the Irish second-tier is usually scheduled throughout a calendar year and not a season, unlike the majority of the leagues across Europe. Borg played 13 games in all competitions, including a cup tie against Dundalk FC, one of Ireland’s biggest clubs, and has caught the eye with a series of eye-catching performances and it’s no surprise that several top-flight clubs in Ireland are already chasing his signature. The former Sliema Wanderers and Gżira United wingback’s versatility on the field proved an asset for coach Ollie Horgan who could deploy him in several roles to ensure his team remained competitive in all their matches. In 27 league games, the Harps won 16 games and drew five times, collecting 54 points. Yet, it was not enough to clinch promotion as champions as Dublin-based UCD pipped them to the crown with 57 points. Borg’s Finn Harps had to overcome the playoff hurdle in order to transform their dream into reality. In their first encounter, they faced Drogheda United. After a nerve-wrecking 1-1 away, the Harps managed to seal a 2-0 win on home soil to move on to the final, where they had the better of top-flight side Limerick. Contacted by the Times of Malta, Borg was delighted to have reached this target with his club and feels that he has adjusted to their system very quickly. “It was a special night for our club when we got promoted,” Borg said. “We were the underdogs, and rightly so, but we turned up to both games well-prepared and I think we put up two impressive showings. At Balzan, Borg struggled for first team football, managing only a handful of cameo appearances both in the BOV Premier League and FA Trophy campaigns. Yet, thanks to his agent’s contacts an opportunity to play in Ireland came knocking on Borg’s door and he did not hesitate to accept the move. “I remember my agent explaining to me about this opportunity and I was looking forward to seek pastures new,” the former Malta international said. “I was meant to stay at Balzan but having received such opportunity, I knew I had to grasp it quickly - Ireland is a beautiful country and the move felt as a breath of fresh air for me to showcase my abilities. Borg was not the only addition to the Harps squad as the club harboured hopes of playing in the Irish top flight. “The club made a lot of investment in the transfer window,” Borg said. “Apart froom me, the club have brought in other players as they sought to challenge for promotion. Borg is known for characteristics as a right-back. Yet, at the Harps, he covered several positions to accommodate the needs of his team. “I feel that this experience was a great learning curve for me,” Borg admitted. During his career, Borg has played for several clubs. Asked about how he compares Maltese football to the Irish set-up, Borg admitted that is hard to explain, even though he feels that there are teams in Ireland that are raising the bar. “It is hard to say where would Finn Harps finish in Malta, to be fair,” he said. Although the season is over, Borg has already some decisions to take ahead of the 2019 campaign and is determined to pick the right option where he can develop his game much more. “I am not sure where I will play next season, because right now I have some offers from other top-flight clubs in Ireland,” Borg highlighted. Besides his club football, Borg has also an eye on the international stage where he is still hoping that his performances abroad can earn him a much-coveted national team call-up. The defender was selected several times for the Maltese national team but has only one cap to his, dating back to a 2013 friendly against Azerbaijan. “I would love to represent Malta once again. My agent sometimes speaks to coach Ray Farrugia,” he said.